The best cheap Beats headphone prices are right here, which great news if you're a budget-conscious shopper who wants to get a hold of the popular headphones at a discount in the latest Beats headphone sales. We've got you covered for cutting edge Beats by Dre wireless options and regular wired headphones. 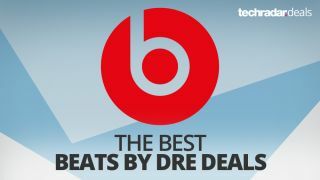 Beats by Dre is arguably the most successful brand of headphones on the planet, with a big name and pedigree behind it. These attributes were clearly recognized by Apple when it purchased Beats for $3 billion in 2014. The best cheap Beats headphone sales on the web can be found right here. We've rounded together all of the current Beats models here, and our system searches thousands of retail sites every single day so can you find the cheapest Beats headphone prices available. We've organized them up from top to bottom, plus thrown in Beats' own taglines for each product to both inform and amuse you. If you've recently grabbed an iPhone 8, iPhone X or iPhone XS deal, then prepare to save even more because there isn't a better place to pick up a pair of excellent wireless headphones than right here. You may recall that Apple made the controversial decision to remove the standard 3.5mm headphone jack on the iPhone 7, which is why finding a great set of wireless headphones is more important than ever. We've ordered the Beats headphone deals on this page to put all the wireless options at the top for your convenience. You can find links to the latest Studio 3 Wireless, Solo 3 Wireless, Powerbeats3 Wireless and Beats X deals below along with a selection of the best Beats deals for the older headphones too. "Hear the music. Not the noise"
The newest entry in the Beats by Dre headphone range is the Beats Studio 3 Wireless. The Studio3 is the best noise cancelling set of headphones Beats has ever made. The battery has massively improved too, as you can enjoy music for up to 22 hours, or even 40 with the active noise cancelling tech turned off. The Beats Studio3 Wireless headphones are a great match for iPhone users, especially the iPhone 8 and iPhone 7, but you can pair them with any smartphone thanks to the Bluetooth technology. The Studio 3 is available in six colors including: red, matte black, white, porcelain rose, blue and shadow grey. "Wireless the way it should be"
If you have an iPhone 7, 8 or XS and want one of the best pair of headphones in the business made especially for Apple's new phone, you really should take a look at the Beats by Dre Solo 3 Wireless range. Below you'll find links to the latest prices. Long after their reveal alongside the iPhone 7, these eagerly awaited Bets inner-ear headphones were finally released in February 2017. These wireless headphones are a perfect match for iPhone owners already missing the 3.5mm port. We're particularly impressed by the quick charge feature that gives you two hours of playback from a single five-minute charge. Eight hours from a full charge isn't too shabby either. You can find the headphones in black, white, grey and blue. Do you lead an active lifestyle that requires the lightweight feel of in-ear headphones without the massive cans on your head? Then the Beats by Dre range has you covered for that, too, because not all models about that authentic studio design. With an improved 12-hour battery life, you're all set for multiple workouts packed with hours of adrenaline-pumping tunes. "Feel The Music, Not The Wires"
Again not cheap, but they are at least compatible with the iPhone 7 and above. The Beats by Dre Studio Wireless over-ears have all the same features as the Beats Studio model above but also come with Bluetooth. That means they can stream music wirelessly from your phone, tablet or laptop. The built-in microphone will also allow you to answer your phone without having to take them off. "DESIGNED FOR SOUND. TUNED FOR EMOTION. NOW WIRELESS"
You can make a massive saving on these cans thanks to the newer Solo 3 models. These are compatible with the iPhone 8 too. The tagline for these Beats headphones comes all in caps, so it must be true. If you're looking for deals on the Beats Solo2 but maybe you're thinking about the Studio Wireless, this could be the pair for you. They are as you would imagine them to be - the same as the Solo2 but with added battery-powered Bluetooth skills to make them wireless. Chuckle - we see what you did there, Doctor. If you hadn't guessed, the Powerbeats2 Wireless are the same earphones as the Powerbeats2 regular, but with Bluetooth and yes, the Powerbeats2 Wireless will work with the iPhone. They connect through a cable behind your head so you can't lose them, but other than that they're cable-free. We particularly like this description of the Powerbeats2 Wireless from the official website: "Powerbeats Wireless was designed to defy the ordinary while catapulting athletes towards unparalleled performance". How can you NOT buy them after reading that? With active noise cancelling, the Beats Studio 2.0 over-ear headphones aim to cut out outside noise so that the sound from its drivers are not distorted (ANC is great at electronically removing white noise on planes and trains but don't expect too much else). These are the top 'consumer' models, so if you're looking for cheap Beats by Dre they're probably not for you. If you want the high end ones, these are for you. "Designed For Sound. Tuned For Emotion"
The taglines only get stupider, people. The Solo 2 is probably the most popular Beats by Dre product, offering a balance of performance and portability. The cups are on-ear rather than over-ear which could affect comfort and will definitely affect isolation from outside sounds. But look at the price, it's quite a bit cheaper than other Beats by Dre headphones. "Lightweight And Powerful. Built For DJs"
As you can see, Dr. Dre wants all DJs to be using these headphones. The earcups rotate so you can do your skillful mixing uninhibited, or indeed so you can pretend to do skillful mixing in the knowledge that you're actually playing a CD unbeknownst to the drunk people bobbing in front of you. The bass in these cans is supposed to be particularly 'big' and you can share what you're listening to with dual-port daisy chaining. "An ideal introduction to Beats for any music lover"
The Beats EP headphones are the cheapest on-ear headphones in the Beats by Dre lineup and are a fine place to start if you've had your eye on the colorful stylings for a while. They're wired via a 3.5mm jack, but at least you'll never have to worry about them running out of battery juice. The tagline for these is particularly uninspiring and it's all in caps again which reminds us of that classic saying: if you've got nothing to say, so it loudly. Err, anyway - these are the first in-ear headphones/earphones on the page. If you want cheap Beats by Dre, this is as good as it gets really. It's a standard pair of earphones which come with tangle-free flat cables as well as a clicker and built-in microphone for taking calls. The tagline for the Powerbeats2 is better while still saying absolutely nothing about the product itself. These earphones are made for using while exercising. They're designed to not fall out of your ears and they're sweat and water resistant. Meanwhile, RemoteTalk controls allow you to easily take calls or change your music without having to fiddle.